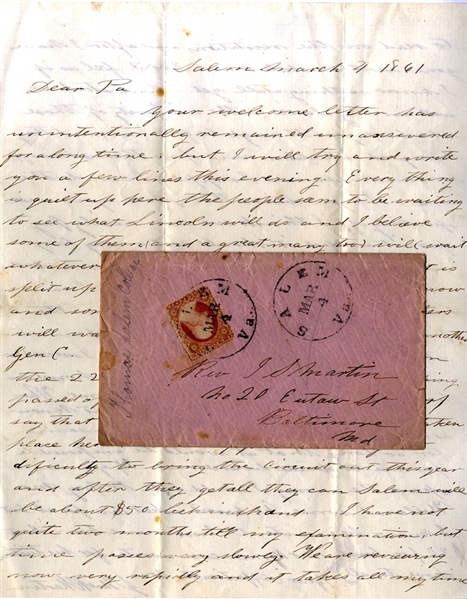 A Southern college student's letter written on the day of Lincoln's first inauguration by John Thomas Ruff Martin (1842-1870) as a student of Thomas Salem College, March 4, 1861, to his father, reading, in part: "…everything is quiet up here the people seem to be waiting to see what Lincoln will do and…some of them…a great many too woo wait whatever he may do. In the church it is split up a good deal. All prefer to go off now and some will at all hazards, but others will wait for Baltimore and for another Gen. C[arson]…there appears to be a great difficulty to bring the circuit out this year…your affectionate son, J. Thos. R. Martin." Martin later enlisted in the 10th Virginia Cavalry. The original stamped transmittal cover is included. Overall near fine.